co-authored by Sarah Mlynowski and Lauren Myracle. Book five in the Upside-down Magic series, co-written with Lauren Myracle and Sarah Mlywnoski. When Willa's upside-down magic rains, it pours. Clouds form under ceilings. Classrooms get flooded. Umbrellas must always be nearby, just in case Willa has an outburst. Willa hates being the source of such sogginess. Even worse, the more she rains, the badder she feels . . . and the badder she feels, the more she rains. All the storminess is threatening to drown her good grades and flood all her friendships. Is there any way to use magic to make the clouds disappear? Or is the storm of the century on its way? Click here for a teachers' guide to Upside-Down Magic classroom activities. 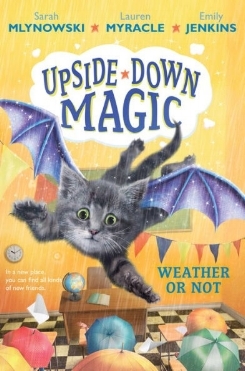 Visit Scholastic's Upside-Down Magic site for matching games, book trailers, quizzes and more.